Kremlin Supporters Pressure Russian Election Observers Before Vote - Integration Through Media ....! (VOA): Police last month detained David Kankiya, an observer at Russia's forthcoming presidential election, yards from his home in southern Russia. Police said his car may have been used in a crime, according to Kankiya. Hours later, Kankiya was charged with disobeying the police, something he denies, and jailed for five days by a court. Weeks later, his car tires were slashed with a knife, he said, and on Tuesday, pro-Kremlin journalists ambushed him. “I have information that you have insulted the Russian people,” one of the journalists said, a video of the incident shows. Days before Sunday's election, which polls show incumbent Vladimir Putin is on track to win comfortably, Golos, a non-governmental organization that monitors Russian elections, says it is under unprecedented pressure. Its problems are part of what Kremlin critics say is a wider campaign by authorities to hinder or silence dissenting voices. Opposition politician Boris Nemtsov was shot dead in 2015, while current opposition leader Alexei Navalny has been barred from running in Sunday's election over what he says is a trumped-up fraud conviction. The Kremlin, which denies involvement in Nemtsov's murder, wants Putin's re-election to be viewed as legitimate and largely clean in the West so as not to further damage already poor relations. At home, wary of street protests, the Kremlin is keen that voters see it in the same way. The Kremlin says complaints about a crackdown on dissent are hollow. Individual cases are a matter for the relevant authorities who it says are only trying to uphold the law. Equally, the Central Election Commission says it will do everything it can to ensure Sunday's vote is free of fraud and has turned to Golos for advice on how to do that. However, opposition leader Navalny, accused by Putin of being Washington's pick for president, has predicted the authorities will resort to widespread fraud to deliver a Putin landslide and has spoken of organizing post-election protests of the kind that roiled Russia after Putin's last election victory in 2012. Golos says the authorities unfairly blamed it for those protests — some of the biggest since the Soviet collapse — because of its work publicizing what it said were serious election violations, something it plans to do again on Sunday. Kankiya, a Golos coordinator in the Krasnodar Region, says that's why he was targeted. A court in Krasnodar disagrees. It rejected his appeal against his arrest and jailing on Wednesday. Police say he was detained after he failed to produce identification during a routine check. Election fraud has been a problem in Russia since the 1991 Soviet collapse. Abuses have often been highlighted by Golos, whose observers spend election day at polling stations and flag suspected cases of fraud to the authorities. Founded in 2000, the year Putin won his first presidential term, Golos says its problems began when Putin returned to the presidency in 2012. “After the 2012 election, their task was to destroy Golos,” Grigory Melkonyants, the movement's co-chairman said in an interview in his Moscow office, referring to the authorities. Golos lost one of its main donors in 2012 when Moscow accused the United States Agency for International Development (USAID) of trying to influence politics and forced it to leave. Soon, weighed down by the red tape that came with being designated a “foreign agent” and facing a funding squeeze, Golos was struggling to function. In July 2016, at the behest of the justice ministry, a court ordered Golos to close. Today, Golos still operates after reconfiguring its structure in such a way that it is not classified as a legal entity. A shoe-string operation run out of a pokey Moscow office staffed by about nine volunteers, it says it relies on private donations from inside Russia. It has coordinators in almost half of Russia's voting regions, about 6,000 volunteers, and dozens of experts who train people how to observe elections. 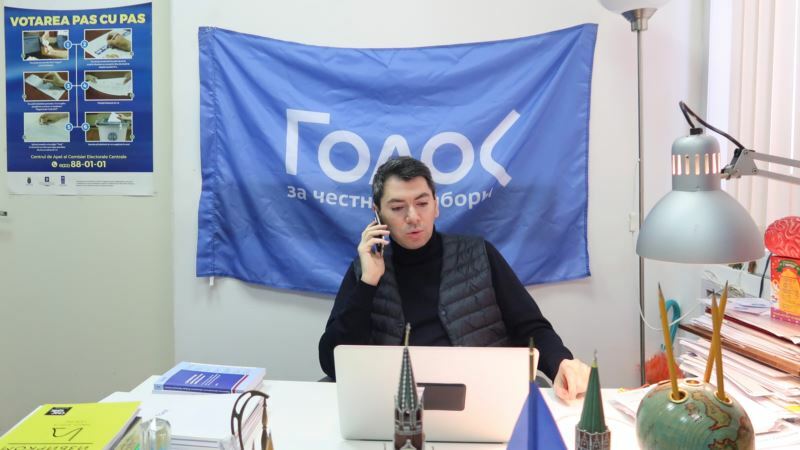 Melkonyants says the movement on Sunday plans to field thousands of observers, run a telephone hot line for complaints, and chronicle reports of electoral abuses on a nationwide violations map on its website. It will deliver its verdict on how clean the election was on Monday. But as election day draws near, pressure on Golos is intensifying. Its volunteers have complained of being systematically stopped for long periods when leaving or entering the country by border staff who tell them there's a note by their name that says they are linked to terrorism, Golos said. REN TV, a Russian TV channel, on Monday broadcast what it billed as a special investigation into Golos and other groups. The program depicted Golos as a shadowy Western-funded group that worked to discredit Russia in the eyes of the world. Andrei Klimov, a senator who heads up a committee in the upper house of parliament to prevent interference in Russia's internal affairs, told the program such groups posed a threat. “They [Golos and other groups] will try to trigger protest,” said Klimov. And on Thursday, Golos said the landlord of a hall in Moscow it had agreed to rent for a call center on election day had annulled the rental contract after being told by the police to back out of the contract or face problems. Kankiya, the Golos coordinator in southern Russia, said he would continue his work regardless.